If you are having trouble reading the phyrexian version, start with turning your screen to the 90° right. Con Lang (or just "conlang") is short for "constructed language", e.g. a language the writer, their friend, or some other associate has made up for the purpose of using in a book or show. No, they did not just say that the Alien/Elf/BeePeople speak a different language, they actually made up an exact vocabulary and grammar, one that can be translated into English (or equivalent). This is where Translator Microbes are abandoned and a dictionary given to the reader. Gibberish does not count as a language, regardless of whether or not the other characters say they can understand it, and using a mere handful of alien words, even if you give them a translation, does not count either. In Real Life, an auxiliary language or "auxlang" is a conlang intended for use by real-world groups. Esperanto is the best known. Argot or Direct Translation. The author just substituted words from their native language, and to translate it back you just substitute them word-for-word back (even if this would produce a Blind Idiot Translation in any real language). Realistically, this may be a secret language used solely to exclude others from the conversation. Results in Conveniently Precise Translations. Foreign conversion. The language is closely based on a language foreign to the audience, but only differing slightly (in either words or structure) from its derivative. May include special letters and phonemes that are not found in the native language, and require a special pronunciation guide to be spoken properly. Not the same as foreign-sounding gibberish. Complete original. Very rare; words, grammar, and pronunciation are made up entirely by the author. More likely to include a unique alphabet and special pronunciations. May be loosely based on a foreign language, sometimes a dead language, but even then a hard translation. Newspeak. A language derived from our own with limited change in the actual words, usually as an advanced form of Future Slang. Overlaps with Strange Syntax Speaker. For the Nineteen Eighty-Four version, see Newspeak. Cypher Languages are a subtrope of this, and many forms of Black Speech fall here as well. Contrast with Wingdinglish where a supposedly alien or original language is just regular English in a strange font. Crest of the Stars uses Baronh, based on an ancient Japanese, and complete with its own alphabet. Super Dimension Fortress Macross and its sequels include Zentradi. It was originally based on Japanese syntax, and drifted away as more was added to it. Nausicaa of the Valley of the Wind has a very detailed Dorok writing system (in which Dorok dialogue is rendered, in addition to appearing on signs and buildings), but leaves out the actual language under it. Tintin has Syldavian and Bordurian; a conlang enthusiast attempted to analyse Syldavian into something coherent, although it turns out it's basically the Brussels dialect of Dutch/Flemish with extra letters spewed all over it. There was also the earlier Arumbayan language, also based on the Brussels dialect in the original French version, but altered to phonetically-spelt Cockney (though it's heavily disguised so as not to be obvious) in the English version. The DCU has not one, but two alphabet ciphers that translate to one of 26 Roman Alphabet Letters: Kryptonian and Interlac. It's explicitly stated that English sounds different than Kryptonian (which has been hinted as vaguely Swedish sounding), which sounds different from Interlac, despite having the same amount of symbols to depict those sounds, and that each symbol matches an English symbol as well. There's some Truth in Television there - German and French sound different from each other despite having the same amount of symbols (in fact, the same symbols) to depict their sounds. The Nazzadi language in Aeon Natum Engel And Aeon Entelechy Evangelion which is often left untranslated when it's not announced by public speakers, but makes sense depending on the situation. Atlantis: The Lost Empire gave us the Atlantean Language. The Fifth Element has the divine language. Which, if you listen to the commentary from the actress on how it was made, is complete bull; no real language works as it is described. Star Wars Expanded Universe uses the a Mandalorian language, developed with a functional grammar, syntax and several thousands of words. The alien languages used in the films were mostly adapted from Earth languages. Huttese is based on Quechua, Rodian borrows from Italian, and Sullustan (the language of Lando's copilot) was actually Haya, a language of Kenya. For the Huttese language, the most common alien language in movies and video games, translations of multiple words and phrases are known, but the lack of a grammar or syntax makes a word-by-word reconstruction of the language impossible. The Star Trek films gave us a functional Klingon language, developed by linguist Marc Okrand, who's also responsible for the Atlantean language of Atlantis: The Lost Empire. Okrand was brought in to develop a full-fledged Klingon language for Star Trek III the Search For Spock, which was based on the Klingon phrases that appeared in the previous films. In fact, there are two competing Klingon languages (see also Diane Duane's Vulcan language in Literature, above). Okrand's is much more functionally extensive, but "Klingonaase", created by author John M. Ford for his novel The Final Reflection, has its fans. So functional indeed, that they translated found the original Klingon Hamlet. Which is now being produced as a play by at least one theater, in the Washington DC area. All the Klingon spoken in every Star Trek film - from Star Trek: The Motion Picture through to the 2009 reboot - is "tlhIngan Hol", and often Okrand coached the actors himself. Unfortunately most writers in the TV series (Star Trek: Voyager and Star Trek: Deep Space Nine) just looked up the words in the Klingon dictionary rather than using them properly, presumably due to time/money constraints. Linguist d'Armond Speers tried raising his child to speak Klingon as a bilingual speaker but abandoned the effort after several years, finding that the vocabulary was not extensive enough and the child abandoned speaking the language when he found only his father spoke it. An attempt was made to translate the Bible into Klingon, but it fell apart because the translators couldn't agree on whether to translate the peace-and-love passages of the New Testament literally, or to instead tailor them for Klingon culture. In Avatar, the Na'vi speak a constructed language developed for the film by linguist Paul Frommer. A Martian language is being developed for Disney's forthcoming John Carter of Mars film, also by Dr. Frommer. Though JRR Tolkien was the one who actually came up with the languages, the people who filmed The Lord Of The Rings expanded on them a bit (and in some cases a lot) in order for them to be used in conversations and as background chorus lyrics. The expanded languages are referred to by prefixing a 'Neo-', as is custom to distinguish them from what Tolkien originally developed. For the Lone Wolf series of gamebooks, Joe Dever developed the Giak language used by the Darklord armies, with a vocabulary of about 400 words, and rules of grammar for agreement of adjectives and adverbs. It was described in the source book The Magnamund Companion, and readers found that the words spoken by the Giaks in the previous gamebooks were actually translatable. The Earthsea Trilogy has Hardic, which we see a little of. And Kargish, Osskili and Old Speech, in which wizards cast spells. J. R. R. Tolkien (The Lord of the Rings, etc. ): The guy was a language professor at Oxford—he knew his stuff. He created a world full system of languages, language families and dialects (just read through them), with an internal history, along with several scripts and modes in which they could be written. Although most of them are not actually fully detailed languages, several are more detailed, and at least the Elven languages Quenya and Sindarin are complete enough to be learned and spoken. (Quenya was heavily influenced from Finnish, and Sindarin was based off of Welsh.) Indeed, the (Elvish) languages came first, and the setting in which they could be spoken came after. The attempts by fan scholars and creators of adaptations to extrapolate from and expand the existing material are usually referred to as Neo-(insert language name). Nineteen Eighty-Four does this with Newspeak, which is not a new language but a degrading hypersymplification of English. Bonus points because an exact guide for the simplification is given. Watership Down gave us the Lapine language; a language for the rabbits. The Wheel of Time gives us the Old Tongue. A Clockwork Orange had Nadsat, created for use by the teenage subculture, based on English but with Russian influences. The Cthulhu Mythos fandom gives us R'yehian and Aklo. Discworld gives us the Kad'k. Tad Williams' novel Tailchaser's Song is an example similar to Watership Down, in that all of the characters are animals (cats, in this case), with their own language. Will Self's novel The Book of Dave introduces a far future where the common language Mokni (a phoneticised cockney initially quite tricky to read) is peppered with bastardised London cabbie slang since their religious book is the rantings of a present day taxi driver. The Inheritance Trilogy has "The Ancient Language" spoken by elves and magic-users (in which it is impossible to tell a direct lie), and less-detailed languages for dwarves, urgals and nomadic tribes. "Less-detailed" within the story, perhaps. The "Ancient Language" is based very closely on Old Norse (as per "Foreign Conversion", above), but the Dwarves' language is far, far closer to a true "complete original". Paolini has actually been known to speak paragraphs in his Dwarvish language when requested to do so at conventions 'n such. Some readers see the Ancient Language as an elaborate cypher for English (the Argot/Direct Translation category above). But another reader remembers the structure being different, and it definitely has rules of grammar, as a grammatical error by Eragon about a word meaning "shielded" becomes a plot point. These rules may at first appear conveniently similar to English, given that the past tense and the passive participle have the same form, but this similarity is common among Germanic languages. Robert A. Heinlein's Stranger in A Strange Land has Martian, which is presented as an essential tool to unlock spiritual potential in humans. The characters spend most of the novel learning the language and, eventually, writing a full dictionary. Interestingly enough, it works almost exactly the same as Orwell's Newspeak (abolishing the need for synonyms), but would lead to a utopian society, instead of a dystopian one. Suzette Haden Elgin's Native Tongue series (Native Tongue, Judas Rose, and Earthsong) featured a "women's language", Láadan. Elgin is a linguist, and the language was an attempt to test the Sapir-Whorf hypothesis — she actually made up the language, and there are online lessons. Ricardo Pinto's The Stone Dance of the Chameleon has Quya. The opening poem is written out in both Quya and English. There is also a system of glyphs to write Quya in and the name every chapter is written out in both English and Quya glyphs. Sometimes attention is drawn in the story to a peculiarity of the language—which completely passes the readers by. Hear the author speak it here. The Artemis Fowl series has lines of Gnommish and Centaurian running along the bottom of each page (omitted in some U.S. editions.) Rather than being graphemes of a full-on Con Lang they constitute a Cypher Language offering an Easter Egg to those who decode them. There are a few spoken Grommish words such as "d'arvit", which is an emphatic swear word. In Barry B. Longyear's Enemy Mine, two main characters learning the other's language is a major theme - so the readers learn some Dracon along with the protagonist. The language is also used in a couple other stories set in the same universe. The Foreigner novels introduce the reader to a good amount of Ragi  (an alien language; one of many spoken by the atevi species). Not surprising, as the protagonist is an interpreter by profession. The Alliance Union universe has the hani, kif, mahen, and stsho languages. Diane Duane created partial languages for the Vulcans and the "Rihannsu" (Romulans) in her Star Trek novels, most of the words of which are given only approximate translations. In-story, the Rihannsu language was originally a direct translation conlang. When the first Rihannsu left Vulcan, they invented a new language—with very different phonemes, but near-identical grammar, to make it easier to learn—and started using it immediately, all in an effort to distance themselves from the planet they were leaving. "… a language I didn't recognize. It was a sonorous, harmonious, flexible dialect whose vowels seemed to undergo a highly varied accentuation". The Railway Series and its companion books give us Sudric, the native language of the Island of Sodor. Modelland has Labrian and Colorian. One seems to be made entirely of vowels and the other is made up of "pops, slurps, and hisses." Kamen Rider Kuuga has the Grongi Language, which is a cipher of Japanese with some words that don't change ("Kuuga" and "Linto") and some grammatical flipping just to screw with the audience. Land of the Lost, Sid and Marty Krofft hired a Ph.D. linguist to create a language for the proto-human Pakuni in Land of the Lost, with a grammar, syntax, and two hundred word vocabulary. The full language is included as an extra on the Season One DVD. The Dothraki language has been reified for HBO's Game of Thrones. The French progressive rock band Magma invented a language called "Kobaiian" for their albums in order to get around the language barrier. On Enya's album Amarantine, about a quarter of the songs are in the Con Lang "Loxian", said to be from a distant planet. In 2005, one of the entries in the Swedish version of the Eurovision Song Contest was Cameron Cartio's Roma. Word of God is he came up with the language himself. Kajiura Yuki's Kajiurago. Nobody besides her knows the meaning of the language. It can be heard in the Madlax theme Nowhere and the Puella Magi Madoka Magica song Credens Justitiam (Mami's Theme). In Warhammer 40,000, both the the Tau and Eldar have their own lexicon described. Warhammer Fantasy Battles have Khazalid, the language of the dwarfs wonderfully described with grammar and pronounciation. The elfs and chaos tongues get some of this but not as much. The Kafer Sourcebook for Traveller 2300 AD includes a brief overview of Kafer language and writing. Werewolf: The Forsaken uses many examples of the First Tongue, the language of the Spirit World. The creators have pretty much said it's generated by going back as far back into Proto-Indo-European language tree as possible and making a few detours on the way. Traveller has enough languages and sublanguages to cover thousands of worlds. To handle this a system is provided for random generation of words as well as sample words and details about linguistic style from various culture. However "Ganglic"(evolved English) is the common speech of trade and travel. Wizards of the Coast hired a linguist  to make the phyrexian (or New Phyrexian if the current phyrexians don't speak the same language as the old ones) language. Phyrexia is a faction of Magic: The Gathering. Some things we do know about the language are, the written form is vertical (top to bottom) and going by these videos, left to right (as thats the order words appear  . 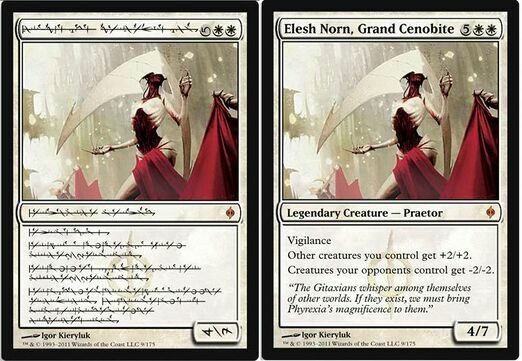 Because its a Starfish Language (probably of the Black Speech flavor), wizards didn't devote the resources to getting the verbal phyrexian part right in those videos (In other words what sounds like gibberish, is gibberish being passed off as phyrexian. In the second video, what sounds like english, is not phyrexian). Good luck learning even the written part. The Elder Scrolls V: Skyrim has the dragon language, several words of which your player character learns during the game, and the language is even spoken by a few characters, mainly dragons. And the main theme song, Dovahkiin, is sung in it. Final Fantasy X features Al Bhed, which is made up of a simple cypher of English/Japanese (depending on which localization of the game you play obviously) but is spoken in the game by the Al Bhed as a real language. As an added feature, the player can pick up 'primers' throughout their visit to Spira and slowly translate the language, letter by letter. This is part of a small New Game+ bonus: The next time a player decides to play through the game, if they had collected most/all of the primers before, they can load up their completed 'dictionary' and understand what various characters/signs are saying right from the beginning! The Ar tonelico series has Hymmnos, a language based on English, Japanese, Sanskrit and German. In the setting of the games, it is an obsolete language, used to interface with ancient technology in the form of songs. Though Hymmnos is the one that gets the most attention, the series also has the Carmena Foreluna and Ar Ciela languages. A detailed insight into all three of these can be found here. World of Warcraft has a whole host of these, with Common (humans), Orcish (orcs), Darnassian (night elves), Gutterspeak (undead), Dwarven (dwarves), Gnomish (gnomes), Zandali (trolls), Draenei (draenei), and Thalassian (blood elves) barely scratching the surface. An interesting note with the Undead: During the beta for World of Warcraft (a.k.a. "Vanilla"), the Undead (being formerly living humans) could speak Common, acting as a Translator between the rival factions. However the player-base's tendency to be... juvenile led directly to the creation of Gutterspeak, and is the primary reason you can never learn additional languages, despite some characters knowing 1-2 languages (Faction and Racial). In a note of ingenuity and perhaps an example of metagaming, Players have over-time, made simple translations for some of the more commonly spoken enemy chatter as perhaps a way to quickly denote if the enemy player is going to be combative or not. (For example, an Alliance player who says "lol", would be heard by a Horde player as "Bur", and going in the other direction, it would read "Kek", to an Alliance player who encounters a laughing member of the Horde). While most people who encounter these languages might cross them off as just made up chatter, there even exists a degree of similar word structure between the Night and Blood Elf languages, given their in-game distant shared ancestry (Darnassian and Thalassian respectively), which shows that the Blizzard creative team probably Showed their work in conlanging. Since in-game NPCs often speak these constructed languages from time to time (battle cries & so forth), any player will inevitably come across some words multiple times, but a complete translation of these languages is unavailable, and only a select number of phrases and words have been given official translations by Blizzard. Klonoa has Phantomile. The second game actually has a song sung entirely in the language. The Legend of Zelda series features Hylian, which usually comes in two flavors: Ancient and Modern. While ancient Hylian may detail the "legend" on which the game is based, it's the modern Hylian that has a consistent and (to a degree, see below) translatable written version (which is seen in the more recent games -- Ocarina of Time and onward mainly). Either way, Spoken Hylian in the games is almost completely unheard of, given the series' mute hero and Sim-speech/gibberish approach given to most of the other characters. Twilight Princess's written script departs from the other games and can be directly translated into English and back. Sadly, the mysterious language the character Midna is heard spouting off on occasion in TP is randomly selected and doesn't match up to whatever she might be telling you in the text box. Although details didn't really start coming out until later in the Wing Commander series, there is a good bit of detail about the Kilrathi language beyond occasional "color" words. Jade Empire has some NPCs speak "the Old Tongue" (Tho Fan), a weird, not-very-Chinese-sounding, Jabba-the-Hutt language specially invented for the game by a Canadian linguist. This was apparently just for "flavour" since it has no relevance in the game at all, and one wonders why they bothered. They are BioWare; that is reason enough. Actually, it has one crucial purpose...it saves on NPC dialogue. Tho Fan includes a much lessened 'generic' dialogue set (And less speakers, too! )...it helps save money on VAs. Phantasy Star uses its own lingo for spells, otherwise known as techniques, which are augmented with specific prefixes, complete with 'language drift' across games (though this is very likely a happy accident caused by translation difficulties). In the fourth game, the prefixes used seem to indicate numerical magnitude: Gi- for times three, and Na- for times ten, based on the spellcasting animations. And this is, of course, never referenced anywhere. The Phantasy Star Online sub-series has a Foreign Conversion conlang in the form of Coralian, which is English with a new, distinct alphabet. The language used on Parum is most similar to what was used for Coralian in PSO, being a simple (if sometimes Engrish-y) instance of English with a new alphabet. The language of the Wutai planet Neudaiz uses the English alphabet, but with letters that look more like distorted kanji. Neudaiz script is also used as an Argot to write in Romaji (Japanese transliterated into the English alphabet), just to further confuse the native Japanese player base (and confuse foreign players even more)! The Moatoob language also uses its own alphabet for English writing. Moatoob also has its own language (as evidenced by Photon Arts and weapons originating from the planet), but it's not been made clear if this is an Argot or something more. Phantasy Star Online 2 will continue the post-millennial tradition of Foreign Conversion conlangs, featuring a new distinct alphabet for Star Fleet Oracle. The Sims's simlish, of all things, has aspects of this. Some of it is gibberish, and it's really hard to catch, but if you listen hard enough there are actually a good few constant words. The demon language of Ozkavosh created by Valve for the remake of Defense of the Ancients is almost entirely symbolic, full of synonyms and essentially requires context to be understood. It also does not conjugate, and due to the demons' nature, the word for "self" (Ozh) is both capitalized and emphasized in speech, or in case of another object of emphasis, emphasized more. Aquapunk: Sennan. The dominant language spoken through the story world, and has been in development since 2006. Currently it's used for names, obscenities, euphemisms, difficult-to-translate slang, and some sound effects. Yes, it's very fleshed out, and while it bears some similarity to English, it is almost completely original. A "Sennan 101" PDF is currently in the works. Juathuur has juathuuvei. It's used mainly for consistency in character and place names; a full sentence has yet to be heard in it. Even Dahm created a few different languages, complete with unique alphabets, for his Overside comics (Rice Boy, Order of Tales, Vattu). The Overside wiki has an article about them. NationStates has many user-created languages in varying levels of refinement. Urban Dead users developed several English cyphers to work with and around the limited speech options of zombies, but a few have tried to construct actual grammars. Zamgrh/kiZombie is the most ambitious and zam arrh zambahz gab zam but most know only a few of the most important words. Centaurians in The Pentagon War speak their own language, but it's intentionally not fleshed out. The author didn't want to spend years developing a real, working language for an alien species that speaks out of 4 mouths simultaneously (!). The first known artificial language was Volapük, which meant "World speak." The language's author was attempting to build a universal language that everybody worldwide could use to communicate. It fell flat for two reasons: (1) The pronunciation was way counterintuitive, always placing the accent on the last syllable of every word and using oddball sounds like ü ; and (2) The creator was a minister who didn't want any of the "naughty words" in his language, so you couldn't cuss in it. Stanley Unwin built a career out of his invented language "Unwinese" also known as "Basic Engly Twentyfido". Deep Joy ! Esperanto, the Universal Language counts so much so. Loglan was developed in the 1950s to test the Sapir-Whorf hypothesis. Lojban: A realization of loglan (short for logji bangu or "logic language") is a derivation intended to be used as an actual language. Lojban isn't too bad if you're good at programming computers. If you're expecting nouns and verbs, though, you'll have to get used to the fact that words change from one to the other depending on where they are in a sentence. That's why all the writing on the language uses non-standard grammatical terms derived from Lojban itself, like "selbri" and "sumti"—wouldn't want to let people think that there are any nouns around these parts. A Northern California argot called Boontling is one of Cracked.com's 5 secret languages that stuck it to the man. It uses English grammar but replaces many of the content words. means "On the contrary, I think it may turn out that this rugged mountain range trails off at some point." The less said about the writing system the better. Simply understanding the principles that define the rules on which the grammar is based requires formal linguistic training. It's Your Head Asplode: The Language." Its later derivative, Ilàksh, was somewhat easier, but that wasn't saying much. The phonology was cut down to 30 consonants and 10 vowels, but there were new grammatical functions to consider that replaced old ones, and apparently all urges to be needlessly obtuse were funneled into the writing system. The current (and final) version isn't much bigger in terms of phonology, and its grammar has been subtly streamlined, with evocative visual aids and explanations. Still, good luck learning to form even the simplest sentences in this beast. Check it out...if you dare. K­ēlen has no verbs. You have to imply actions by declining your nouns. Solresol contains no official letters or phonetics, just the 7 notes of the solfège scale. It's meant to be "spoken" with musical instruments, although it can be hummed or whistled. Thankfully though, it can be transcribed with the pronunciations of said solfège scale, with the 7 colors of the rainbow, or with a set of 7 symbols. Incredibly, it was created as a language for the deaf. Is that "7 colors of the rainbow" the European rainbow (which doesn't include kimidori) or the Japanese rainbow (which doesn't include indigo)? Klingon is modeled after Navajo, but adds a bunch of extra complications just to mess with you. The subject of a sentence always goes on the end, for example. Not entirely. Spoken Klingon actually started out as gibberish—James Doohan was tasked with coming up with a few sufficiently alien-sounding syllables for the Klingons at the beginning of the first movie, which he did without any real regard for syntax or grammar. It was only later that linguist Marc Okrand took those sounds and expanded upon them to create a working Klingon language. Amusingly, written Klingon is still very much a starfish language—there is absolutely no correlation between the written and spoken languages; indeed, the former is more or less a random collection of "letters," and attempting to translate them is impossible. The preferred method for speaking Vulcan, according to the few actors who have done so onscreen, seems to be "Speak English, then dub something alien-sounding that matches your lip movements in post-production." In Star Trek: The Motion Picture it was clear that at least some of the Vulcan was a Relex, and not a clever one -- for instance, "olgica" was obviously "logic". Rikchik is a sign language for tentacled aliens (rikchiks) with no sense of hearing. Humans can't speak it, though they could theoretically learn to understand it. From the rikchiks' perspective, human languages are even more of a Starfish Language - we communicate over a completely foreign medium. Many esoteric programming languages tend to this, with the most extreme example likely being Piet, whose programs contain no letters or numbers at all - it is written with colors. Zompist.com is the home of the online version of The Language Construction Kit, which is an excellent resource for getting into conlanging. The site's home page also includes a link for purchasing the printed version, which expands upon the online version, including several chapters exclusive to the printed version. Also, the creator of the kit has come up with quite a few constructed languages for his own conworld.